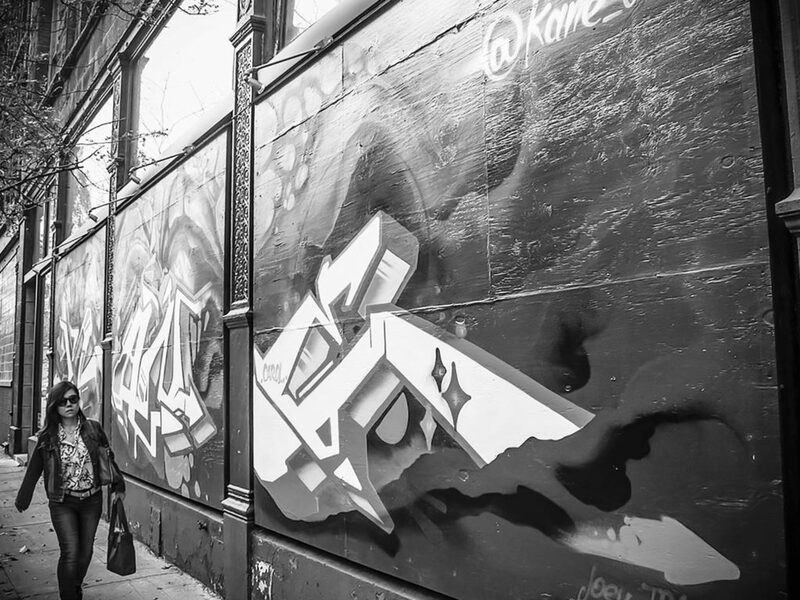 Years ago, the artist and graffiti-writer Miguel Aguilar, also known as Kane-One, came to the School of the Art Institute of Chicago (SAIC) as an undergraduate with little classroom art training, but with experience in street art stretching back to age thirteen. His unique experience forced him to be honest with his painting instructors, making it clear to them that the way the department was structured did not work for what he wanted to do artistically. “They let me not go to my studio class and instead just paint in my neighborhood. I would just bring photographs as proof that I had painted.” He would try to take the concepts that his teacher has taught him in class and transfer them to the walls he painted—some of these methods would work and others would fail. This unique education taught Aguilar not just technique but what’s important to be an artist: the ability to experiment and try new things outside of the boundaries that an artist is used to. Now Aguilar himself is a lecturer at SAIC, where he teaches the History of Graffiti, and will be teaching a new course called Spray Runners, Street Art, and Body Training in the fall of 2017. Aguilar’s History of Graffiti course covers the history of different graffiti artists, crews, and influential time periods within graffiti, like the eighties, when “there used to be more open permission walls, meaning that the owners let anybody go and paint there,” Aguilar said. “The whole city could come and paint.” He compared this to the scene now: a lot more art is going up, but these walls are going to people already established within the graffiti/arts community. It’s more difficult for kids that are new to the art form to be able to paint legally because they don’t have an established name. It was against this backdrop that the Graffiti Institute was born in 2012, a nonprofit intended to create “spaces and opportunities for young people in Chicago to experiment with graffiti and street art in a safe space, where they don’t have to potentially get into dangerous situations just to learn how to do this art form,” Aguilar said. Most of the classes the Graffiti Institute offers take place at Mana Contemporary in Pilsen. Besides serving the needs of today’s Chicago graffiti scene, Aguilar’s own personal history straddling the lines of street art and institutional art played a part in its founding. “We certainly have a mainstream culture in America and then everybody kind of identifies themselves against the core center, so if you don’t identify in that you inevitably have to figure out ways about how you have to navigate your life in order to get around these constructs,” he said. Part of navigating these constructs is creating spaces for yourself and others that promote education and self-expression in ways that are limited in current educational systems. Courses at the Graffiti Institute are run more organically than other course systems so they can more closely match how graffiti-artists tend to create. Recreating the self-determined street vibe of any form of hip-hop in the classroom is hard because hip-hop is all about the individual building individual strengths and skills on their own. The institutional settings that classrooms create may provide students with structure, but it prevents students from going outside of that structure. Aguilar and the Graffiti Institute administration think that it is important for students to be able to learn in a less restricting—and more innovative—way than they are used to. Take one course offered this year at the Graffiti Institute, “Revelations.” Aguilar ran this course with Kerry Richardson, a socially engaged media artist and an adjunct associate professor at SAIC who cofounded the Plug-In Studio, a new media art collective that works to support teens and adults in underserved communities around Chicago. Revelations explored the intersection between graffiti and virtual reality. Aguilar asked students to take pictures of spaces in their neighborhood and create their own collaborative graffiti pieces to be virtually placed in these locations. Running February 25 through April 14, the course culminated in the show “Revelations: Augmented Graffiti” on May 13 at the Chicago Art Department. At the reception, guests were able to download an app that would allow them to move their camera over images and see the art that students created. In addition to designing courses for the Graffiti Institute, Aguilar also tries to bring more understanding of street art into established art schools and organizations, like SAIC. Spray Runners, Street Art, and Body Training, Aguilar’s newest course, got its start when he began reflecting on the physical aspects of graffiti that usually go unnoticed. “I started realizing the correlation between running and cardio work that goes into painting a piece at a wall,” he said, be it painting above or below eye level, or trying to run away from something. Regardless of the legality of what an artist is painting, creating graffiti involves more creativity and physical endurance than most tend to realize—even the artist themself, considering how many years Aguilar has been painting graffiti. True to nontraditional form, school’s not quite out for the summer, either. This past Saturday, Aguilar and the Graffiti Institute held a program called “Open Walls” during the 606 Block Party along the Bloomingdale Trail. The Graffiti Institute set mobile walls up so that kids could come by and try their hand at spray painting. Featured artists Gloe, Cove, Solo, and Ali 6 got a chance to paint and show kids tricks and tips—and perhaps draw in future eager students, to attend similar programs Aguilar hopes to continue providing throughout the summer. Hello, my name if Hanna Slayback and I’m a high school student, I’m writing my final speech on if graffiti is considered art. I believe it is and I was wanting to get your opinion on it. In the speech I need to persuade my audience into getting involved with graffiti and I was wondering if you had and classes coming up soon. Thank you for your time.